Fay Jones of Fayetteville, Arkansas, studied under the great Frank Lloyd Wright, and eventually ascended to heights rivaling his master. Jones became one of the most acclaimed and significant architects of the late twentieth century. He won the prestigious AIA Gold Medal in 1990, awarded for a lifetime of work that included his masterpiece, Thorncrown Chapel, a “little glass chapel” near the quaint village of Eureka Springs, Arkansas. The Chapel was recognized in 2000 by the AIA as the fourth most significant structure of the twentieth century. 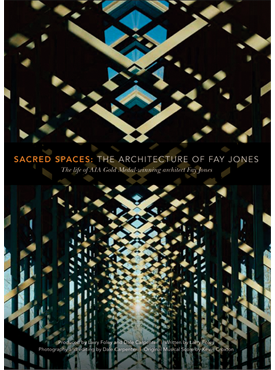 Sacred Spaces is a one-hour documentary film produced by the Emmy Award winning documentary film team of Larry Foley and Dale Carpenter, both professors of Journalism at the University of Arkansas, the same school where Jones worked for much of his distinguished career as an academician and practicing architect. Emmy Award winner Kevin Croxton composed the musical score. Jones was among the most successful Frank Lloyd Wright acolytes, having lived and worked at Taliesin in 1953 but subsequently finding his own architectural voice. Fay Jones died in 2004 at the age of 83, and is survived by his wife, Elizabeth “Gus” Jones, and two daughters, all featured in the documentary film. Bonus features include presentations about Jones’s work by Robert Ivy, Robert McCarter, and Roy Reed. In 2009, the University of Arkansas dedicated the Fay Jones School of Architecture, in honor of its most famous graduate and faculty member. Begun in 2008, the collaborative publications venture between the Fay Jones School of Architecture and Design and the University of Arkansas Press pursues projects that document and celebrate creative achievements in various forms of environmental design, design preservation, and design history. Projects tied to Arkansas are especially, but not exclusively, sought. 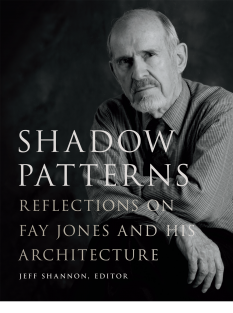 The inaugural publication, a magisterial documentary DVD on the life and practice of Fay Jones, exemplifies our ambitions both in terms of subject and quality. If you can't find what you're looking for, or just have a suggestion, please email info@uapress.com or call 479-575-7258.